It’s been an exciting time here for us in the Reporting team and we’re especially proud of the tremendous progress that’s been made to provide you with an easy-to-use, cross-project, cross-tool reporting solution. We’ve built on the foundation of the Jazz Reporting Service and Data Collection component in 5.0 that many of you have helped shape to bring several new advancements in reporting in Collaborative Lifecycle Management (CLM) 6.0. I encourage you to give the latest release a try and give us feedback! ** July 14 – 2015 Call to action **: Visit us [at booth #203] at Agile 2015 to experience IBM’s DevOps solutions for collaborative development, continuous testing and continuous release & deployment. The first thing you’ll see is that we’ve now adopted Jazz Reporting Service as the umbrella name for the whole set of reporting components we’re working on. This includes the Report Builder (formerly Jazz Reporting Service), Data Collection Component, Lifecycle Query Engine (in technical preview) and the ALM Cognos Connector. 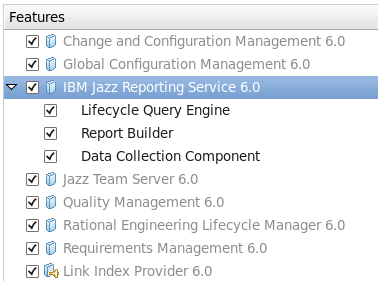 You’ll now see Jazz Reporting Service fully integrated in the CLM 6.0 installation and setup. This means you can setup Jazz Reporting Service seamlessly as you set up the CLM applications you use. Each of the components of Jazz Reporting Service is also integrated into the Jazz Team Server and Application Setup supporting evaluation, custom and scripted setup. There’s no need for a separate download and setup for Jazz Reporting Service! You’ve asked and we’ve listened! We’ve been busy adding in new capability that we’ve heard from many of you of what you would like to see in order to fully utilize Jazz Reporting Service for your reporting needs. Here’s a brief highlight of the new items we’ve added. We’ve beefed up the number of reports we provide ready to use out of the box. These include burn-up and burn-down charts as a new visualization type. We’ve also introduced a new set of ready-to-copy reports that you can be duplicate and then refine further in the Report Builder. You can find a list of these reports with descriptions. You can now add computed columns into the reports you create with the Report Builder. Get a count of open versus closed work items, or find out what percentage of test case execution records have been completed. Here’s an example showing both percentage and counts of stop ship items as compared to the whole. You’ll also be able to click and drill down into what makes up these numbers in either the table or other graphical visualizations (bar chart, pie chart). Conditions that have hierarchies like ‘Planned For’ and ‘Filed Against’ are now represented with corresponding hierarchical controls that allow easy selection of an entire tree of the hierarchy. Traceability reports can now be created for missing relationships with the ‘Does not exist’ option. This option can be useful, for example, if you want to create a report on Requirements without test cases that validate them. We’ve also added the ability to trace from work items to work item approvals and their corresponding approver. For each relationship in the traceability path, you can specify whether that relationship is required, optional or does not exist. We’ve had rave reviews from customers who tried DCC in 5.0 because of the much faster data collection performance providing them the ability to update data more frequently. In 6.0 it is now the exclusive data collection technology used in CLM for the data warehouse. We’ve also made it faster for first time initialization and restarts. Version 6.0 also introduces the Lifecycle Query Engine into CLM. The Lifecycle Query Engine creates an index from your CLM data and can interpret the configurations (baselines or streams) you might have in either the Global Configuration or the Quality Manager applications. With Report Builder in 6.0 you can create reports on this lifecycle data in the same self-service manner as you’re accustomed to doing from Data Warehouse sources but now also from the index in Lifecycle Query Engine. You can scope the reports from the index by configuration to let you view results for the baselines or streams you’re interested in. While we were working to move the Jazz Reporting Service into the CLM installation and setup and out of the RRDI package, we took the opportunity to revisit how the Report Server within RRDI is packaged. The Report Server included a Cognos Business Intelligence server plus additional code from our reporting team to integrate this BI server with CLM. In 6.0 this additional code is now packaged as the ALM Cognos Connector. The setup and configuration of the Cognos based reporting solution is now transparent. You set up your own Cognos BI Server and use the ALM Cognos Connector component to integrate it with the rest of CLM. This approach provides a clear path of using a Cognos BI Server in the deployment patterns that the product can support on its own. We’re continuing to make strides in ease of use and functionality, so give our latest 6.0 reporting features a try! We welcome suggestions and feedback to help us make sure that we’re providing the best possible reporting solution for you.